The provisions relating to Point of Taxation (POT) are very essential element of any law as it fixes the point when the liability to pay tax arises. If the provisions relating to POT are not there then assessee always wants to defer the liability of tax and on contrary the government always want that the assessee should discharge the liability at earliest. So to mitigate this issue or contradiction the provisions relating to POT are also framed in GST. The liability to pay tax on supply of Goods or Services or Both shall arise at TIME OF SUPPLY of GOODS or SERVICES. Now, the question arises that what is the Time of Supply of Goods or Services before understanding the GST scenario of Point of Taxation (POT) let’s see the PRESENT SCENARIO of POT. 3 VAT/CST Incidence of Vat arises on transfer of property in goods including deemed sale in terms of Article 366(29A) of the Constitution. ♦ as determined in accordance with the provisions of this section. Suppose Mr. A raise bill for goods Rs. 1100/- to B and B paid Rs. 1500/- to A. 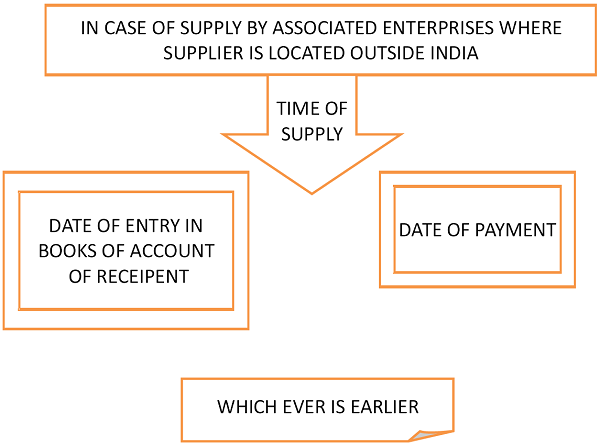 In this case A received an advance of Rs 400/- then the time of supply in respect of advance of Rs 400/- will be at the option of Mr. A will be the date of issue of invoice in respect of such excess amount. √ of the recipient of supply. (b) the date of redemption of voucher, in all other cases. Suppose Pizza Hut has given vouchers to Raymond and then Raymond issues these vouchers to his staff. 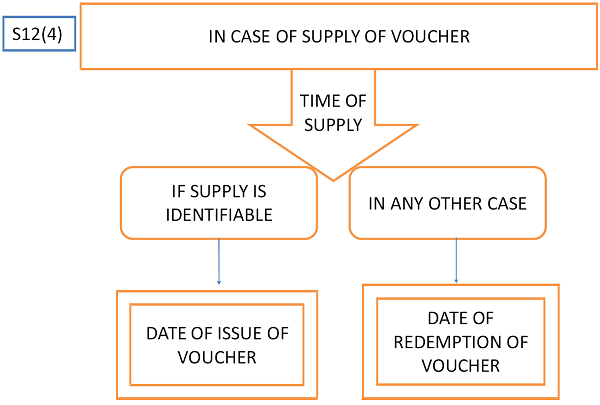 Now, If the value of the voucher is identifiable then for Pizza Hut the Time of Supply will be the date of issue of Voucher and if the value is not identifiable then the Time of supply will be the Date of redemption of Voucher. (b) in any other case, be the date on which the tax is paid. ♦ shall be the date on which the supplier receives such addition in value. 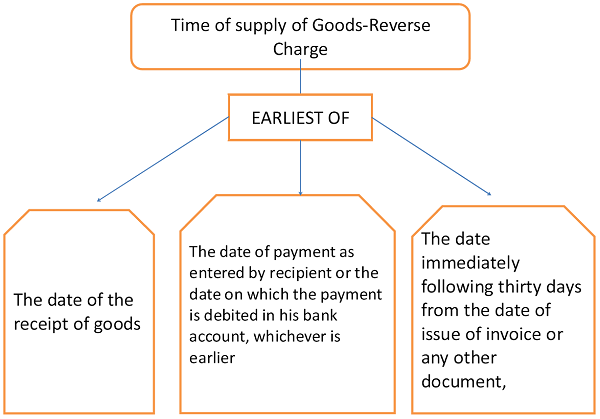 ♦ In the present scenario there is no provision relating to taxation of Interest, Late Fees or penalty for delayed payment but now in GST Scenario the same is taxable. Suppose A raise bill for services of Rs. 1100/- to B and B paid Rs. 1500/- to A. In this case A received an advance of Rs 400/- then the time of supply in respect of advance of Rs 400/- will be at the option of Mr A will be the date of issue of invoice in respect of such excess amount. ♦ receives such addition in value. 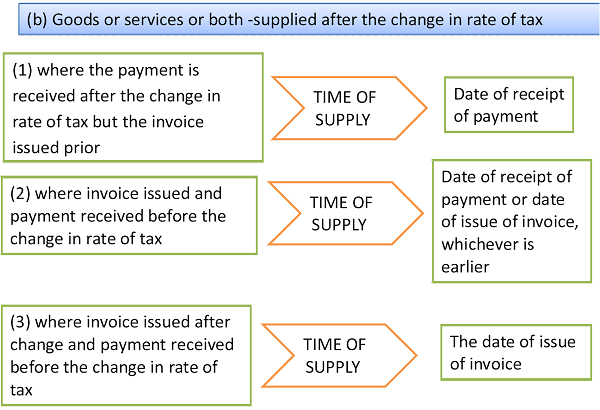 S 14 Change in rate of tax in respect of supply of goods or services. How to get job work under gst ?